Dirt: Evil In The Heartland is a thriller novel by author John P. Goetz. In Goetz’s familiar, darkly psychological style, the story begins in a tiny backwater town in North Dakota, where three unfortunate boys – Danny, Booger and the title’s Dirt – grow up amid squalor and abuse. The violence in which they are raised dampens the spirits of all but one, who flees the town of Arvilla to discover that the rest of the world is almost as bad in its own way. He needn’t worry though, for fate will pull him back to the dirt roads of home when a body is discovered and the finger points to one of three men. So begins a gritty tale where past and present collide. As someone who’s read all of John P. Goetz’s previous books, I was very pleased to get my hands on Dirt, and it did not disappoint me. The narrative had all the descriptive prowess and small town charm of a Stephen King classic, landing the reader in a vivid setting with Arvilla, grounding them in reality before terrible and tragic events take place. Dirt is a boy born to father Tubbs, who regards him as just another pair of hands to work, and mother Trude who convinces herself that her son was born evil, and needs redeeming. Whilst the other two boys of the tale have slightly better upbringings, all three are thrown into genuine suspicion which kept me turning pages right to the end. Goetz’s best work so far. Dirt by John P. Goetz follows three childhood friends that live in Arvilla, North Dakota, named Dirt, Danny, and Booger. The first part of the book tells of how these friends grew up and what they experienced before high school ended. Each boy has his own unique personality and experiences life in different ways. The rest of the book is about them as adults. They are forced to come together again after a woman is found murdered. John P. Goetz surprised me by making the five parts of Dirt so different from each other. The first part has an almost innocent quality to it. I never expected what was to come in the second part. The third part was even more shocking because the mystery begins to unravel. The fifth part was the most shocking of all and completely threw me off guard. 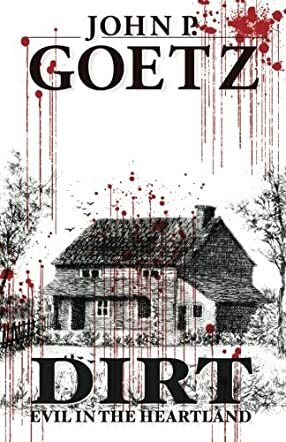 I thought I had everything figured out before the end of the book, but Goetz threw a major curve ball which had me rereading certain parts of the book to make sure I did not miss anything. The characters were all very likeable. I felt so bad for Dirt and how his mother treated him growing up. I really liked that Goetz gave a cameo part out and explained why he did it. I think more authors should do something like this. Dirt by John P. Goetz was a captivating story. Overall, I really liked it. If you enjoy suspense with a little mystery thrown in, then this is the story for you. Just make sure you read the entire book to the end. John P. Goetz has done it again! Dirt is a psychological thriller that will haunt your days and your nights. Three boys were born hours apart during the summer of 1978. They were born into innocence in the rural community of Arvilla, North Dakota. The boys are destined to be friends – from kindergarten to high school graduation, they are inseparable. However, they were not three peas in a pod. Each boy has a distinction and uniqueness that develops from their home environment. As they grow and mature, this distinction becomes more obvious. After graduation, Danny heads off to UCLA on a full scholarship, he wants to become a lawyer, not a farmer. Booker and Dirk, better known as “Dirt,” remain behind and carry on with their simple lives. The boys, now men, are brought back together by a tragic gruesome event. Danny is desperate to help and find out the truth, but the truth may reveal a diabolical killer. John P. Goetz is a masterful storyteller. He grabs the reader and pulls them into the story whether they are willing or not. Dirt illustrates the essence of emotional upheaval. It plays havoc with your heart and mind. You love and hate characters. You love and hate the simplicity and hardship of the rural setting. You find yourself rooting for the underdog, who may very well be evil. As you read, you are in a personal tug-of-war trying to calculate “who really did it.” Goetz oozes out information regarding the sick antagonist, exposing the depth of a dark, evil soul. The narrative dips and dives and twists and turns and, at the precise moment, plummets into the shocking climatic turning point. If you are a fan of Criminal Minds, you will not be disappointed in Dirt. The plot builds page upon page. The characters grow and complement each other. Most of all, the conclusion is one you will never forget. It leaves you feeling creepy, yet with a sensation of satisfaction. Dirt by John P. Goetz is the story of a guy whose name is Dirk, but his nickname from his youth - Dirt - sticks with him, and while the story progresses, he even uses it to open an account on a dating website. We first meet Dirt, his family, and friends when Dirt is still a young boy. His mother thinks he is the son of the devil (but what does that make her? ), his father just wants him to work on the farm, and the jocks at school have it in for him. Dirt's only friends are Danny and Booger. During adult life they take different directions - more or less - but something happens that brings them all back together. Girls go missing, something really bad is happening to them. Could one of the trio be part of the gang responsible for the nightmare in the rural town nobody ever heard of? Dirt by John P. Goetz is a book I would put right next to some of Stephen King's books, just that Goetz's writing isn't quite so vulgar - fortunately. Oh yes, he does use bad language and describes not so nice things (I hope he only knows how to describe them so well because he researched them well), but he describes the gruesome in a way that is good to read, or maybe there's something wrong with me. I absolutely loved this book. It's incredibly well written, the plot keeps you guessing, and it's intriguing. I finished it within just a couple of days. Even a small town like Arvilla, North Dakota, has an interesting cross section of people. This is certainly true in Dirt: Evil in the Heartland by John P. Goetz. Three boys, each born a day apart, grow up in vastly different families and experience a wide range of situations that most people would say shaped their personalities. Danny, Dirt and Booger stayed close throughout school, even as others bullied Dirt. Danny, star quarterback and straight A student, has the opportunity to spread his wings and leave rural Arvilla and his loving family for Los Angeles and a position in a large, successful law firm. Dirt, about to leave town to escape years of abuse, ends up taking over the farm and doing a very good job. Booger grows up to become a sheriff, always trying to impress the ladies. When young women begin to disappear and the unexpected discovery of remains points to Dirt as the villain, the paths of the three childhood friends cross again with unexpected consequences. Dirt: Evil in the Heartland by John P. Goetz captures your attention and holds you riveted until the very end and even beyond. Portrayed with amazing depth, the characters become so real you can imagine sitting down and having a drink with them, listening to their stories, and feeling their pain. The question this book brings to mind is where evil comes from – is it organic (something the body is born with), is it a matter of development and environment, or is it something that comes from far outside and really affects the soul? Reading Dirt not only provides you with a thrilling story but something much deeper to ponder long after the last page is finished.